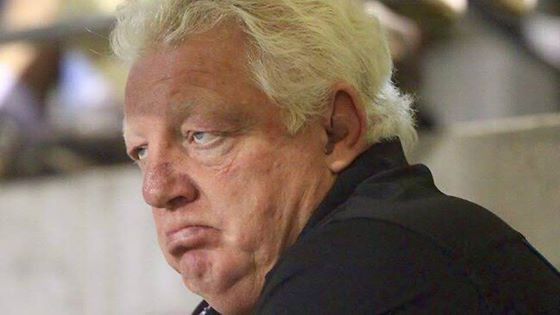 Phil Gould is unlikely to see out the full season at Penrith, according to The Daily Telegraph’s Phil Rothfield. I actually find this article offensive as it suggests in some perverse way Gould built Panthers. Just wish Gould would stop whining…he has thrown plenty under the bus and those of us who can remember…vividly recall how he deserted us when we really needed him. Pay him (Gould) what we owe and get him out of the joint! first and foremost I’m a Panther fan, not a Gus fan. Rothfield however, doesn't rank in my book. I have only one question - where the hell did they find that photo of Gould that appeared in the article?? Rothfield could have made his story better by using this one from Saturday night. Geez, that’s scary without his channel 9 makeup artist in tow. Gotta say though, if we don’t deliver a premiership in the next 2 years, he is a failure from a game standpoint, if not already considered a failure. Sacked coaches, scandals, hidden agendas etc etc all of which appear to have derailed any sense of balance he “created” external to the top squad of players. I’m not going to read too much into this. IF the story is true, then there are some serious issues with Gus and the Board, it would look like the two can’t effectively work together. Throw in the Ivan Cleary and Gus not talking rumor and it would seem like a real toxic environment. My problem with this is this… there are not sources to these reports. Furthermore, both members of the board (Alexander and O’Neil) both refuting the claims as well as Gould and Cleary, Alexander said himself that he has been with Gus on several occasion where IC and PG are talking with each other. Also look at the sources of the claims, Phil Rothfield and Paul Kent. These individual have done nothing but deathride our club, trying to drive a wedge into our club. They saw the issues at the start of the season, and decided to pile on with their dribble. I say to them, reveal your sources or shut up. Greg was on 2GB yesterday and they were his words. What would you expect them to say? Do you think all is well? I’m not overly worried either way, he has done a lot of good for the club over the last 7 years & we seem to be in a sustainable position now. As others have said the source of the story isn’t exactly reliable, so I will take it with a grain of salt. A few years ago myself & a few others were having a quiet chat with Gus after a fan day. He said at the time his goal was to work himself out of a job. I daresay if he isn’t in that position already, he would be close, so who knows, maybe there is something to the story. IMO last nights performance speaks volumes, we have issues and it might even be melding into the playing group. Normally if their is issue external to the playing group, they will still stand up on game day and play like no issue exists, that performance was akin to not liking the bloke next to you!!! you would like to think the playing group hasn’t been affected by what is reportedly happening in and around the club but we are all human and the rubbish swirling around Panthers is quite sad and could be draining on the players. Lets face it we have had the May/Phillips issue and again Phillips leaving the club not to mention ex players at other clubs being dragged into it and add to this mix the reported issues with Gould v Cleary, Gould v the Board and it all adds up to a potent mix of uncertainty. Like i said i hope the players can seperate the issues but it could go a long way to explaining what we are seeing on the paddock by our team. If indeed it is affecting the squad…the Board should move swiftly to remove Gould and any doubt about who is running the club. Caught a few glimpses of the dressing room on TV after the game. When Gould walked in and grabbed a beer & sat down, the look on Cleary’s face was like ‘what the hell are you doing in here’. I don’t think there is any love lost. … wasn’t Ivan’s beer was it ??? Ivan would have had a boutique beer, Gus the old fashioned New because that is our sponsor. On a serious note, the powers at be are oblivious to the impact of this situation, who in their right mind works for someone who sacked them? Tension is paramount regardless of the personality and or external professional attitude. In a company I once worked for, people that were no longer required, but not easily sacked, were put on the staff contact list with title ‘Special Projects’. It meant they had nothing to contribute & it became a wait for them to realise this and then leave to save them from embarrassment , as everybody else knew they were on ‘death-row’, and they were no longer on the team. I wonder how long Gould will take to realise that he is on Special Projects? He probably missed his best chance to leave with his reputation intact by not going in the off-season, but if he were to go now, at least he could say his job is done, and he wants to move to a new challenge. Or he could just hang-in for the cash, or even death-ride IC and then step in to save us again. … sometimes a good clean up reveals hidden gems. !!! … and then what happened ??? Well, looks like it was destined to happen. Let’s continue this discussion the new dedicated thread here.